Until the discovery of the Savory Collection, there was only one known recording by Fats Waller, Jack Teagarden, and Eddie Condon. Now, we're thrilled to bring you a previously unknown and unissued jam session featuring this trio of musical friends. On today's podcast, Loren Schoenberg shares his favorite moments from the jam session. Add our playlist to your Apple Music library to listen to the full-length tracks. This is Loren Schoenberg, Founding Director and Senior Scholar for the National Jazz Museum in Harlem. One of the most outstanding items in the entire Savory Collection is the jam session that we feature on Volume 3 of our Savory Series on Apple Music. It was led by three musicians who were close friends, and who couldn’t have been more different personalities, but who blended so beautifully: Fats Waller, Eddie Condon, and Jazz Teagarden. The most famous by far of the three was pianist Fats Waller. He was a singer, a comedian, star of stage, screen, and radio. He wrote many, many hit songs. He died much too early in 1943 and he was a big figure, literally and figuratively, in American popular music and around the world. The guitarist Eddie Condon was known not so much for his guitar or banjo playing, but for the fact that he was a catalyst. He was a band leader who put together a group of musicians that played a variation on New Orleans jazz called Chicago Jazz, because most of the musicians who played it came from Chicago. Eddie Condon famously had a nightclub that he named after himself, and made recordings for decades under his own name featuring a group of musicians playing traditional jazz. The trombonist Jack Teagarden never had great success as a bandleader on his own (although he did have a big band for a while). For the last decades of his life he toured with his own groups (with the exception of his performances with the very first version of the Louis Armstrong All-Stars). Teagarden was a wonderful virtuoso on the trombone. Again, just a sample of Fats Waller, Jack Teagarden, and Eddie Condon in 1929, the only time that they were known to play together. But getting back to Volume 3 of the Savory Collection. You know, it’s one thing if a session was known to exist, or written about, and collectors for decades and decades could salivate over the prospect of hearing this music. Well this one totally slipped by the boards. It wasn’t written about. It wasn’t noted anywhere. And there it was, on a series of aluminum discs in the Savory Collection. Now, it’s not enough that we have Fats Waller, Jack Teagarden, and Eddie Condon. The reed players are two of the most original under-sung reed players of the ‘20s, ‘30s, and ‘40s. 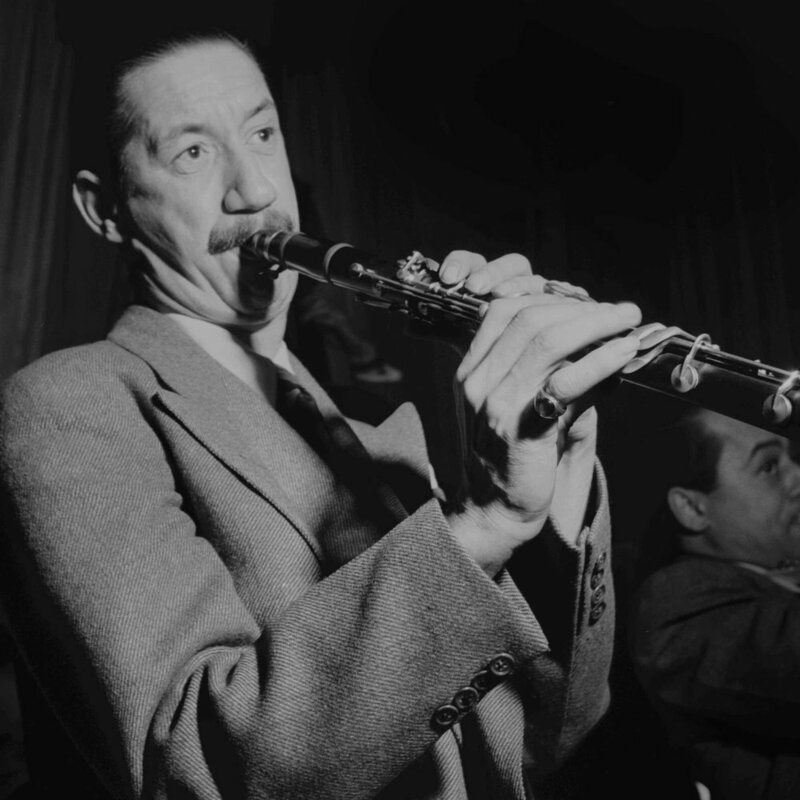 The clarinetist, Pee-Wee Russell, had an idiosyncratic style. It’s kind of like someone who musically blindfolds himself and has to feel around the corners for the chord changes. In some ways, he’s like Thelonious Monk. And in later years, the jazz producer George Wein put together Pee Wee Russell, who got going in the ‘20s, with the modernist Thelonious Monk for a now famous session at the Newport Jazz Festival. The tenor saxophonist is Bud Freeman. 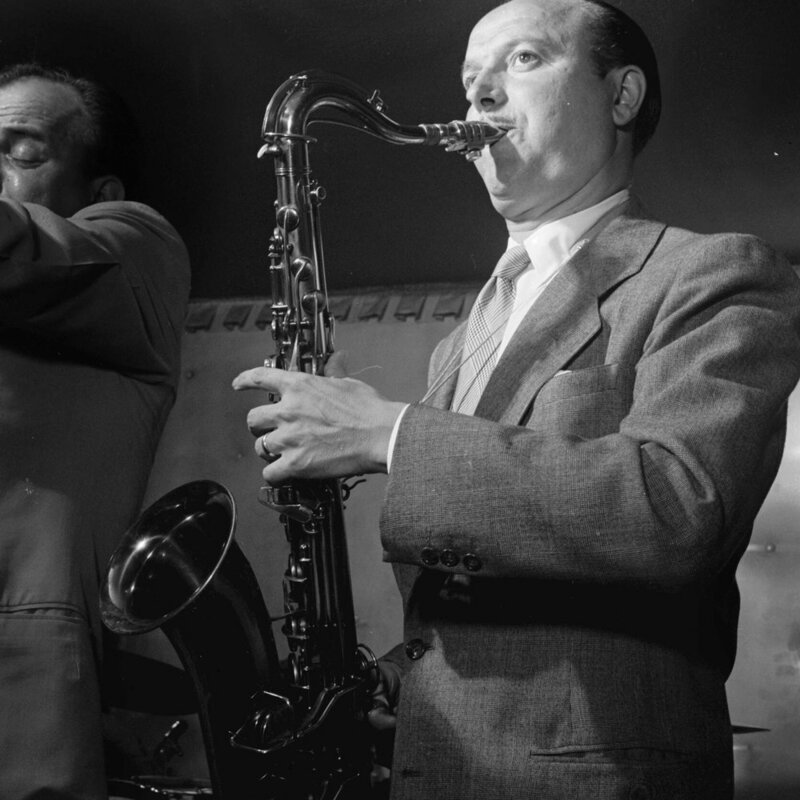 We frequently say that the jazz tenor saxophone really relates to Lester Young and Coleman Hawkins, and virtually everybody can be traced back to some influence of those two men. Bud Freeman was really a third-party candidate. He had his own style going back to the ‘20s. Lot of humor in it and great rhythm and harmonic knowledge. He didn’t sound like anyone else. Some people did follow him down that road and he did have disciples, but his kind of tenor sax playing never had widespread influence. It doesn’t take anything away from him, but actually makes his accomplishment all the more amazing. In fact, why don’t we listen to Bud Freeman’s solo from “China Boy,” a real up-tempo romp from this previously unreleased jam session. You’ll get a real sense of his tone, his time, his sense of humor, and the pure Bud Freeman-ness (if that’s such a word) of this music. Just a sample of Bud Freeman’s solo on “China Boy” from this unissued jam session. No one ever sounded like that before, and no one ever sounded like that since. It’s an amazing and original concept. So, we have Fats Waller on the piano, Jack Teagarden on the trombone, Eddie Condon on guitar, Pee Wee Russell on the clarinet and Bud Freeman on tenor sax. The trumpeter is Jack Teagarden’s younger brother, Charlie. The bassist is Artie Shapiro who was a regular member of the Eddie Condon band during those years. Zutty Singleton on the drums. He was really the first great drummer that Louis Armstrong had a musical relationship with during the ‘20s. He’s on many of the early Armstrong classics and he’s a founding father of jazz drums along with another New Orleans drummer, Baby Dodds. Let’s hear just a short sample of a very rare Zutty Singleton drum solo. He didn’t take that many. You’re the first people to hear this since it was broadcast on the air back in 1938. This is truly an amazing band. They play typical jam session tunes of the time. Of course, they played the blues. And we’re going to hear a sample, not only of a Jack Teagarden and Pee Wee Russell solo, but also of Fats Waller backing them up. So many times, when we talk about great pianists, we focus on the solos, but it was the ability to accompany that also made the great pianists great. Here’s Teagarden, Russell, and Waller, previously unissued, jamming on a rare blues. Play: Fats Waller, Jack Teagarden and Pee Wee Russell jam a rare blues. They also play “Honeysuckle Rose” of course, and “I Got Rhythm.” “I’m coming Virginia” is especially interesting. It was a tune that was introduced to jazz by great vocalist Ethel Waters in 1929. A year later, a huge fan of Ethel Waters, the cornetist Bix Beiderbecke, made a record of it that influenced players all around the world. Let’s hear just a little sample of Ethel Waters and then Bix Beiderbecke doing “I’m Coming Virginia,” 1926 and 1927. Then we’ll hear the new, previously unknown version from Fats Waller and friends. Play: Three versions of “I’m Coming Virginia” by Ethel Waters, Bix Beiderbecke, and Fats Waller. All told, this is a magical session. We have it in phenomenal sound quality which is a tribute to the engineers of the Martin Block jam session. And also to the fact that Bill Savory took it off the air in such superb fidelity. So dig in.